In Court Dances, Amanda Harberg’s palette sparkles with her trademark sense of magic, delight and warmth. Initially inspired by the fast and syncopated bounce of a squash ball, Court Dances grew into a celebratory and soulful suite in three virtuosic movements. 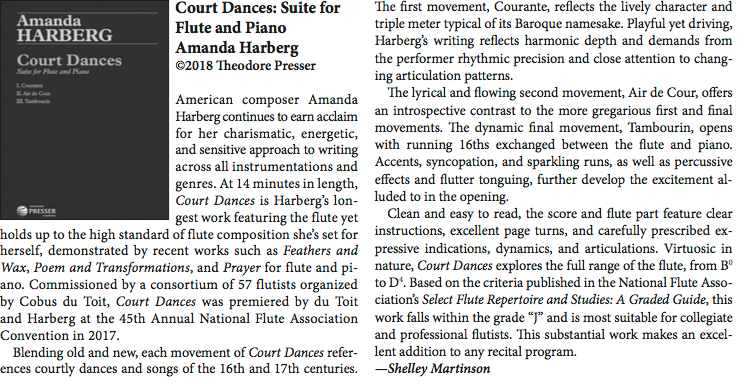 Court Dances was co-commissioned by 57 flutists from around the world in a consortium that was spear-headed by flutist Cobus du Toit. It was premiered at the National Flute Association convention in Minneapolis in August, 2017 by Mr. du Toit, with the composer at the piano.